You'll be surprised at how easy these Parmesan Sesame Chicken Strips are to make. The Parmesan coating gives it a boost of flavor, and the chicken cooks up so moist and tender. It's the perfect dinner that will make everyone happy. My kids are addicted to chicken nuggets. They would eat them everyday for lunch and dinner if I let them. They love our healthier version of Homemade Chicken Nuggets. These chicken strips are our grown-up version of chicken nuggets. They are baked to crispy perfection. 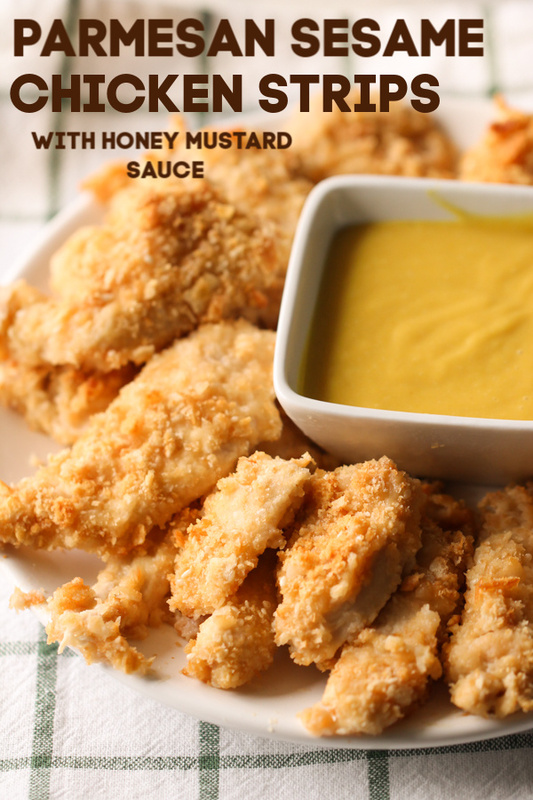 We love the delicious homemade honey mustard sauce for dipping the strips. We think your family will love them too. These chicken strips are so easy to make. You can’t go wrong. If you like them a little bit crispier, just leave them in the oven for a few extra minutes. 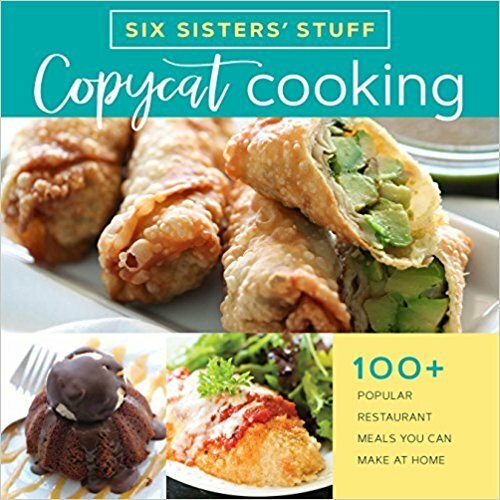 do chicken breasts work best for these chicken strips? We like using chicken breasts for these Parmesan Sesame Chicken Strips. We buy them in big family size bags in the freezer section, and then thaw just what we will need for recipes. Chicken breasts are the best price. Chicken tenderloins will also work great in this recipe. You may still need to slice them into a few strips. Boneless skinless chicken thighs will work in this recipe, too. We often buy whatever chicken is on sale. So know that any of these options will taste great. can you substitute the Ritz crackers in the crumb coating? We love using Ritz crackers in this recipe because it gives a delicious buttery taste. The buttery taste adds so much to the chicken strips. You could definitely use other dry ingredients in place of the Ritz crackers. The taste will vary a little. Here are a few ideas. do these chicken strips freeze well? These chicken strips freeze well. A freezer bag is all you need. 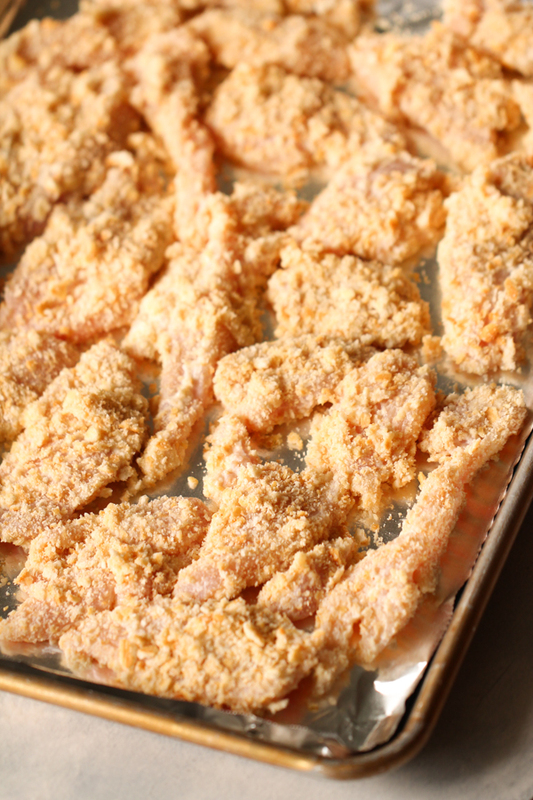 The easiest way to freeze them is to lay the cooled chicken strips on wax or parchment paper. Lay them in the freezer until frozen. Then transfer them into the freezer bag. This will keep all of the crunchy coating in place as you transfer them into the bag. Then just thaw and reheat when ready to eat. 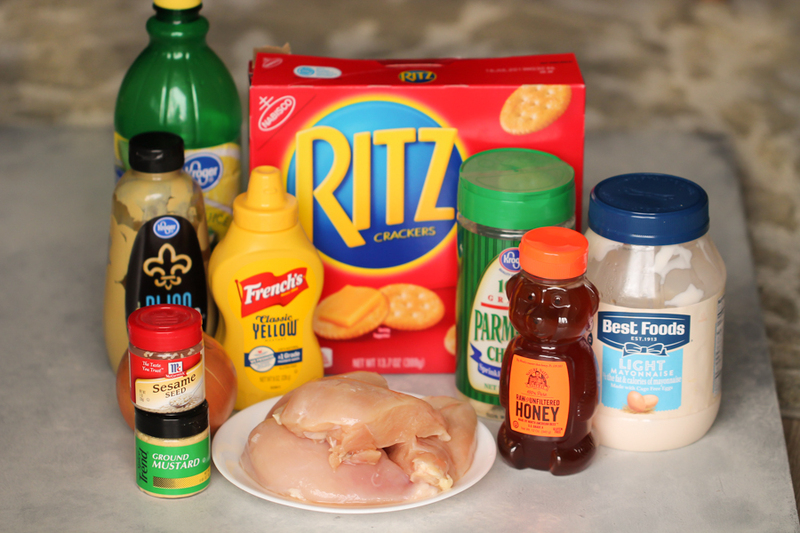 You will be surprised at how simple these chicken strips are to make. They are so tasty. Just some simple ingredients and you have an amazing dinner for your family. Cover a baking sheet with foil light sprayed with non stick cooking spray. Place crackers in a Ziploc bag and roll over them with a rolling pin until crushed. In a bowl combine the mayonnaise, onion, and mustard. In a second bowl combine the crushed crackers, sesame seeds, and Parmesan cheese. Cut chicken lengthwise into 1/4 inch strips. 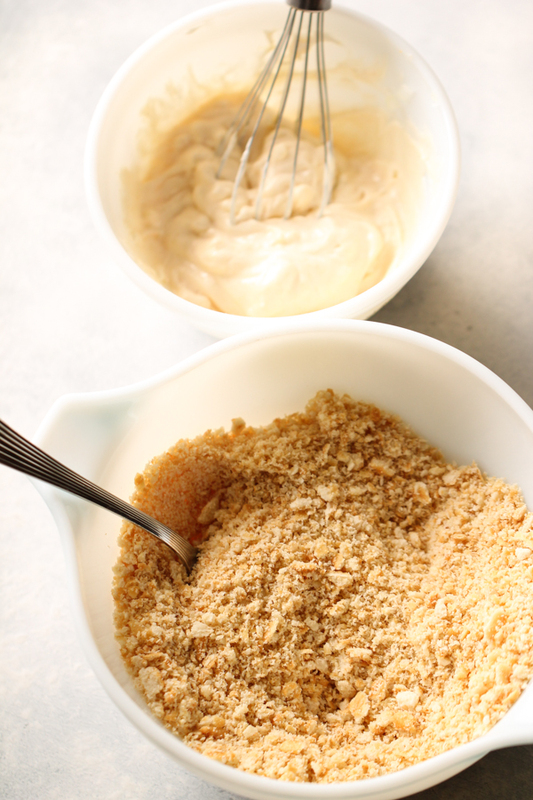 Dip each strip into the mayonnaise mixture and then into the dry crumb mixture. Place each strip onto the prepared pan. Bake uncovered for 15-18 minutes. While the chicken is cooking prepare the honey mustard dipping sauce. In a medium sized bowl combine the mayonnaise, yellow mustard, Dijon mustard, honey, and lemon juice. Mix until combined. Remove chicken strips from the oven when done baking. If you like them crispier, leave in a minute or 2 longer. Serve warm chicken strips with dipping sauce. Sturdy Half Sheet Cookie Sheet – The best cookie sheet for so many recipes. Rolling Pin – Our favorite classic rolling pin. Whisk – A great 3 pack set of whisks for so many purposes. Stuck in a dinner rut? Check out these simple and delicious chicken recipes that your family will love. Cover a large baking sheet with aluminum foil and lightly spray with non-stick cooking spray. Place crackers in a Ziploc bag and roll over them with a rolling pin until they are finely crushed. In a bowl, combine mayonnaise, onion, and mustard. In a second bowl, combine crushed crackers, sesame seeds, and Parmesan cheese. Cut chicken lengthwise into 1/4" strips. Dip strips into mayonnaise mixture, then into crumb mixture. Place chicken on foil-covered baking sheet. 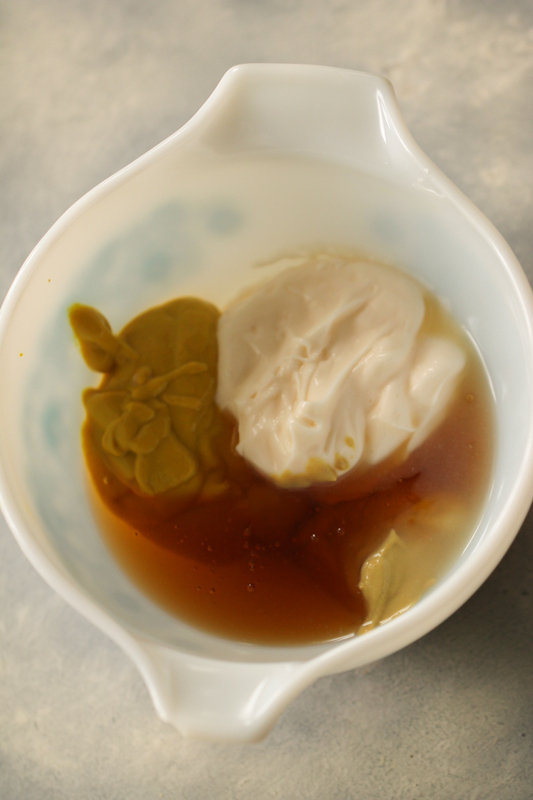 Combine mayonnaise, yellow mustard, Dijon mustard, honey and lemon juice until fully combined. Kristen will show you how easy it is to make General Tso’s Chicken in the Instant Pot. Love the chicken strips and LOVE the honey mustard! Also - got to get the book!!! I'm nine years old and I made this for my family and we love it! Thank you for the awesome recipe!